"Coupling lively anecdotes with the principles of probability, Joseph Mazur balances the fun of a great coincidence with the logical thinking of a mathematician. With a lightness of touch and a witty turn of phrase, Mazur sweeps aside pseudoscience and conspiracy theories, proving that there are rational explanations for even the most extraordinary events." "The chances are very slim that you'd ever read this blurb. Asimple-minded calculation puts the odds at about 50,000 to one against.Yet... here you are. How weird is this seemingly farfetched coincidence?Well, dear reader, you've picked up the right book to answer that question." "Mazur delivers a solid exposition of an element of mathematics that is fundamental to its history." Mazur's lively and accessible writing makes what could otherwise be a dry, arcane history as entertaining as it is informative." Mazur treats only a subset of F. Cajori's monumental A history of mathematical notation (Dover, 1993 first edition 1922) and there is overlap with many other mathematical history books ..., but Mazur adds new findings and insights and it is so much more entertaining than the first and differs from the second because it is much broader and from the third and fourth (which concentrate on the role of zero), and these features make it an interesting addition to the existing literature for anybody with only a slight interest in mathematics or its history. This book, written with the extensive source citations of a scholarly work yet accessible to any reader familiar with arithmetic and basic algebra, traces the often murky origins of this essential part of our intellectual heritage…. Reviews for What's Luck Got to Do with It? When to hold, when to fold. What makes Exchequers, poker players and other punters go for broke? 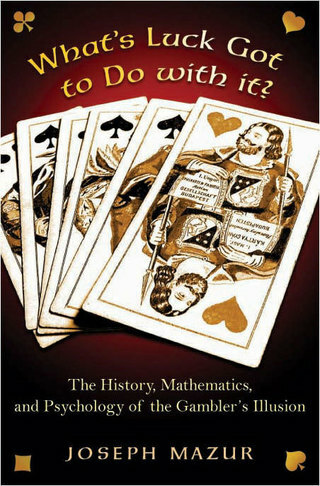 "Appealing to historians, gamblers and mathematicians alike, ‘What’s Luck Got To Do With It?’ has been recommended to anyone working the casino industry. 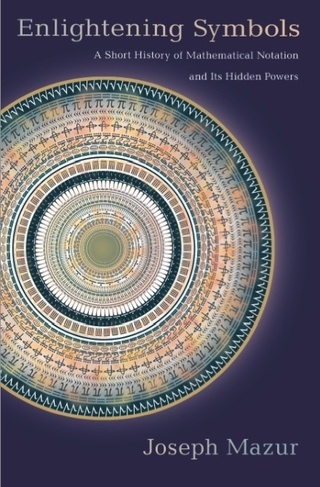 With its broad range of chapters, Mazur’s book is appealing to virtually anyone with an interest in the human psyche. " "...an entertaining and accessible tour of the history of gambling, the way mathematicians quantify luck and the psychology that keeps gamblers returning to the table. A book worth taking a chance on." Joseph Mazur is a mathematics professor who’s written books about math for the popular audience, and his writing style is wonderfully suited to discussing a complex subject in a friendly way. Maybe the greatest compliment I can pay Mazur is that he doesn’t come across like a professor in his writing–he’s more like a very interesting guy sitting next to you on a plane ride out to Las Vegas, who’s got several hours worth of anecdotes and an occasional mathematical proof to back them up. What’s Luck Got to Do With It? tackles what might be the million-dollar question when it comes to gambling: why do people consistently bet against the odds? Demonstrating that he’s not approaching his subject from too great a distance, Mazur treats the reader to a debate between his uncles–two of whom are racetrack devotees, one of whom insists that gambling is a sure path to ruin and warns against feeling to sure that luck is on your side. The book essentially seeks to identify just what luck is, and reconcile it with the dry mechanics of probability and the law of large numbers. 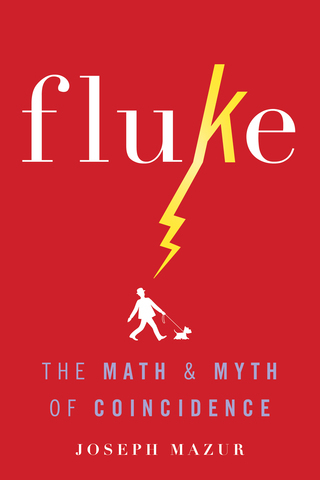 Involving history, psychology, and several examples from popular culture,the book uses its mathematical backbone to ask and answer some key questions about gambling and luck. The book is divided into three parts. The first is an outstanding brief history of gambling from the dawn of time to about 2008. No matter what you’ve read about the topic, you’ll probably still learn something new here. Then Mazur looks into the math of gambling and luck, and relates the underlying theoretical truths that make gambling work the way it does. Along the way Mazur works in several personal anecdotes that keep the reading lively. After laying down the mathematical foundation, Mazur explains “the analysis,” or why people continue to gamble against the odds. He incorporates research about problem gambling, but also addresses non-problem gamblers, who make up the great bulk of the gambling public. Because Mazur’s not judgmental about luck and gambling, but is analytical, the book is a winner. It’s not just a mathematician telling us that we’ll never hit a million-dollar jackpot–it’s a mathematician looking at why we continue to hope to hit that jackpot. This book should be required reading for anyone in the casino business, and anyone who spends more than a fraction of their disposable income on gambling should find it informative, if nothing else. It’s a reasoned, but also passionate, search for the meaning of luck that may change the way you look at a pair of dice–or your mortgage. Blending math with memoir, probability with psychology, and heuristics with history, Mazur has written an essential book for anyone who wants to get a better idea of why we consistently bet against the odds. From the betting window to Wall Street, he offers insights into both the mechanics of chance and the enduring appeal that that luck holds for those who wager every day, whether they call it gambling, speculation, or just hoping for the best. Engaging and illuminating, this is a guaranteed winner." at the University of Nevada, Las Vegas,and author of Roll the Bones: The History of Gambling. I recommend this book enthusiastically. Mathematical readers will not learn much new mathematics but they will learn quite a bit about history, both of probability and of the social context in which it emerged, and will have a glimpse of the psychological issues arising in the translation of theoretical results to the real world. Non-mathematical readers, conversely, may find in the historical and psychological aspects of the subject a “hook” that will pull them into the mathematics. Finally, Mazur is most in his element when telling stories from his own life; interweaving these stories with related mathematics is a hallmark of Mazur’s work, and a most enjoyable one." --Michael Lugo, Journal of Humanistic Mathematics . "This is a fascinating book. It's a fresh, funny, philosophical look at gambling by a mathematician who knows what he's talking about, and who has quite obviously thought about gambling for a long time. Mazur isn't afraid to make provocative, opinionated statements. I have not seen a gambling book like this before. I think it will attract a lot of readers." "This book is significant int hat it offers a lively and diverse collection of gambling-related ideas. Mazur's robust blend of anecdotes, history, psychology, and mathematics differes from other attempts to discuss these ideas. He offers plenty of inights into the questions and issues he raises." Click here to read a blog about What's Luck Got to Do with It? 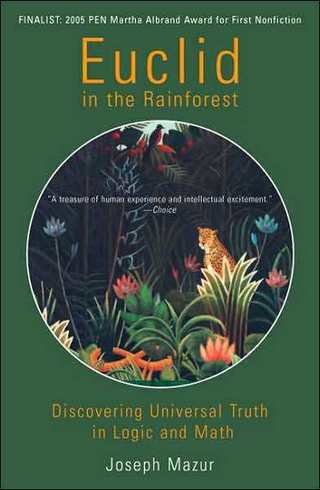 Euclid in the Rainforest is a Finalist for the PEN: Martha Albrand Award for First Nonfiction. Also, It has been selected as an Outstanding Academic Titles of the Year 2005 by the library journal Choice. "In Euclid and the Rainforest, Joseph Mazur brilliantly explores the symbiotic relationship between the physical and the mathematical worlds. He asks the questions: How do we know that the world is what we experience it to be? Can logic guide us through the rainforest of science and math and provide us with a chance to discover the underlying foundation for their truths? In his highly original search, Mazur is a brilliant forester whose graceful pursuit leads him to understanding the logical bases of human reason. Mazur has given us a stylish and seductive book that convinces the mind even as it delights the soul." From The Guardian "Ian Stewart's top 10 popular mathematics books"
A thoroughly readable account of the meaning of truth in mathematics, presented through a series of quirky adventures in the Greek Islands, the jungles around the Orinoco River, and elsewhere. Examines tricky concepts like infinity, topology, and probability through tall tales and anecdotes. Three different kinds of truth are examined: formal classical logic, the role of the infinite, and inference by plausible reasoning. The story of the student who believed nothing except his calculator is an object lesson for everyone who thinks mathematics is just 'sums'. The book deserves to be assigned as supplemental reading to all undergraduates taking science classes. "THIS is one of the most fascinating science books I have ever read. 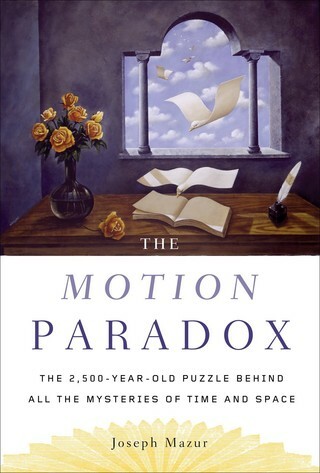 It tells the story of the 2500-year quest to gain an understanding of the slippery concept of motion. Beginning with the Greek paradoxes that showed that motion is utterly impossible, the book progresses through Galilean relativity, Einsteinian relativity and superstring theory, finally coming up to date with the still unresolved question of whether space and time are continuous or grainy. Joseph Mazur has succeeded in telling a fresh and untold story with clarity and style." "The Greek philosopher Zeno sought to reveal that motion and speed were logical impossibilities; one of his famous four paradoxes argued that a moving object can never reach its destination, because it must first travel half the distance, then half the remaining distance, and so on. In this entertaining, informative diversion, Mazur (Euclid in the Rainforest) spins out the discoveries of the mathematicians and scientists who have grappled with the riddles of time and space over the last two millennia, from Aristotle up to Heisenberg and contemporary string theorists. Yet for all their answers, the fundamental premise that motion is an illusion created by consciousness still remains. Many elements of the story, such as the astronomical breakthroughs of Galileo and Tycho, or the simultaneous development of calculus by Leibniz and Newton, have been discussed in greater detail in other recent books. But Mazur spins a good yarn, and his conversational tone holds readers' attention even as the mathematical formulae pile up in later chapters." Copyright © Reed Business Information, a division of Reed Elsevier Inc. All rights reserved. This book is on the Library Journal's list of the best Sci-Tech books of 2006.